Holy Trinity Brompton is arguably the best known contemporary British church. Part of the Anglican family, it shot to prominence through the Alpha course (an introduction to Christianity now conducted in something like 45 countries around the world. Within the UK, HTB has been very active in planting new churches – initially in London, but increasingly in other parts of the country as well (when they’re invited). Today I visited one of HTB’s church plants (a London suburban church that’s been running for seven years), and then their office HQ to explore just how it’s been happening, what approaches they’re using, and what’s been learned along the way. Both visits were insightful, and I really appreciated the welcome and the conversations (and the eye-opening tour of the Alpha/HTB offices). HTB use a range of approaches as the particular context demands, and I heard a consistent expression of commitment to working with the wider denomination. They’ve worked hard on leadership development, on understanding their unique DNA (or charism) and what it is that they offer. Many of the initial plants were into empty church buildings, where HTB would sent a leader and team and establish a new community from scratch (mostly in well established areas of London). In recent times they’ve started what we might describe as “re-planting” or re-vitalising where a leader and team will go into a very small church (which might to all intents and purposes be on its last legs). Of particular interest is that there are now second and third generation church plants – where previously planted churches are themselves planting. Sometimes they’re using one of the approaches describe above, or in some cases a multi-site (multiple church communities, multiple sites but a shared identity and leadership) or “minster” (a mother church with semi-dependent child churches) approaches. The story is exciting, but they’re very quick to point out that while it sounds easy and exciting when it’s described in broad-brush terms, the reality is planting churches in contemporary Britain is a difficult task, and one that takes intense commitment, careful planning, and an extraordinary leader and team. There’s also a willingness to be hard-nosed when required – to make sure the right team go, that the context is ready, that the planning is done, that everything is in place to give the project the best chance of success. That all seems to start with a pretty heavy commitment to prayer (and I think we’d all agree…that’s as it should be). We also talked briefly about the Alpha course. It’s been a few years since I checked in to have a look at Alpha, and it sounds like it’s come a long way. The day I visited HTB has just hosted the second night of their current Alpha course with something like 600 guests attending. The materials have been thoroughly modernised since I last checked in, and are re-filmed every few years to ensure production values, presentation and content are contemporary. It’s no surprise that one of HTB’s church planting practices is to start an Alpha course immediately every new church plant launches. It has been and continues to be a key part of their approach. I came away thinking it’s past time I checked in to have a look at what Alpha 2017 looks like. Clearly HTB is a particular kind of church, with a particular style of worship, and a particular set of values. And many of their plants, while growing up in a contextual nature, share that DNA. Equally clearly, they’re doing some very good things within the Church of England in the British context, and via Alpha in the wider world. It was a visit I’m glad I had the opportunity to make. When this postcard publishes, I’ll be on my way home. It’s been a genuine privilege to undertake this trip, to visit Leicester, the FX gathering, St Mellitus, London Anglicans, CMS, the Methodist Church and HTB over the last couple of weeks. I’m so very thankful to all those that have welcomed me and shared in inspiring conversations, and told their stories. I don’t underestimate how fortunate I’ve been to be able to make the trip. I’ll publish a more general summary in a few days. 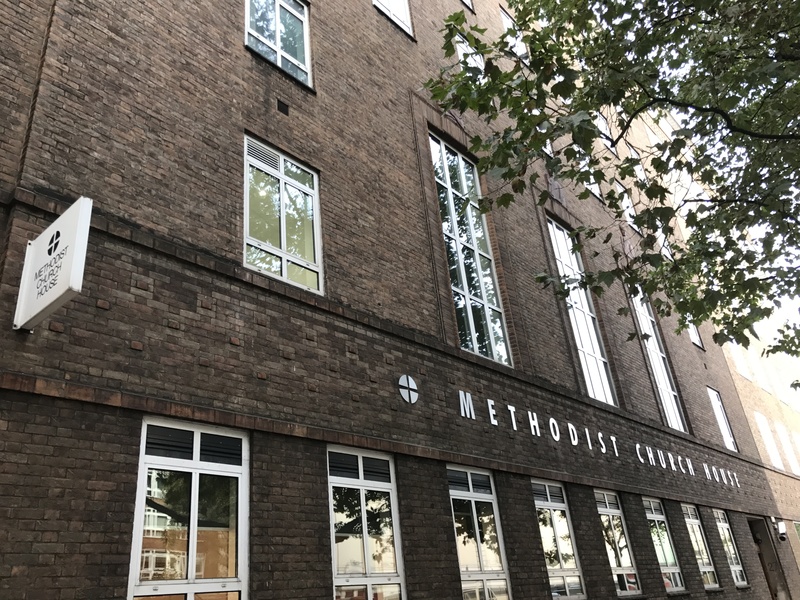 Today I had the privilege of visiting UK Methodist headquarters at Methodist Church House, and meeting with a bunch of people from their Discipleship & Ministries team (including Jude, Graham, Richard) and the Scholarship, Research and Innovation team (Stephen and Allan) along with a number of others. 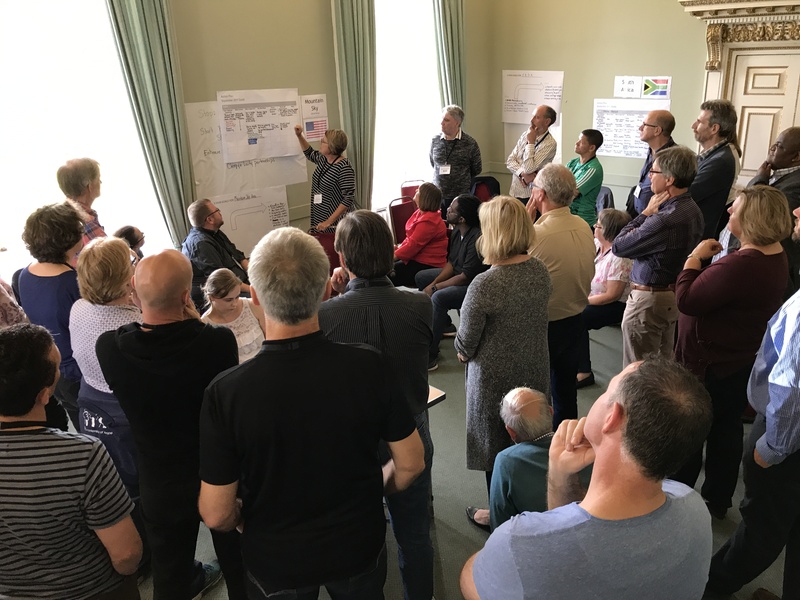 The conversations were rich and wandered around a host of topics – including data and statistics, evangelism, contemporary challenges facing churches in both our countries, leadership development and more. It was a pleasure to meet with the team, and the connection between the Methodist church and our own Uniting Church (a venture formed when Methodist, Congregational and a large portion of the Presbyterian churches united in 1977) is strong. It felt like our churches are family (which of course, they area). I had the privilege too of addressing the Connexional Team meeting, and sharing a little of what’s happening in the Queensland Synod of the Uniting Church. Naturally I couldn’t help but share a little of my own (potentially incorrect!) theory of change along the way. You can read it here. Incidentally, I had shared these thoughts with Mike Moynagh during a visit to the Church Missionary Society’s Pioneer training HQ (see yesterday’s postcard) and he wanted to add a layer below “Hope” (you’ll have to read it to understand). He suggested that dissatisfaction (or what we might called a ‘holy discontent’) is the foundational layer of any attempt to bring meaningful change – and that hope comes next. It’s an interesting idea and I’ll give this some more thought. On the surface at least, there’s a lot in common between the situation in which the British Methodist church finds itself and our own. Many of the challenges are similar, many of the opportunities are similar. The context, of course, is different – but not so different that we couldn’t explore our respective stories and approaches. The Venture FX project has seen the church here invest heavily in a bunch of new pioneering initiatives – taking the church into genuinely new places and seeking to establish new church communities. Many of the projects continue, and those are important in their own right, but along with the viability of the particular projects themselves, the church is trying to pay attention just as much to the lessons learned along the way for future initiatives that might be quite different in character. The capacity to build a culture of innovation across the church might well depend on how well the VFX experience can be processed – and that challenge (building a church culture that welcomes innovation) is a big one. I heard briefly a story of Trey Hall at Birmingham and some work he’s doing with the team there. What caught my attention was the use of the term “progressively evangelical” to describe something of the theology and character of Trey. Quite often we might describe those with an evangelical heart as being of a more conservative (theologically) character, but this story reminded me that this need not be so. That evangelism need not be the exclusive domain of a particular group within the church – but is something for all of us. Planting new churches can be something that the whole church (in all its theological diversity) can work towards. I’ve made a mental note next time I’m in the UK (that’s not me dropping a subtle hint by the way!) to go and visit Trey. There’s an interesting shift in the way that ministers are training and released that’s being spruiked by Michael Moynagh. From a more traditional Select->Train->Deploy approach, to Discern->Encourage->Support. I’m interested to dig into this a little more. It was, as I said, a real privilege to visit Methodist House. I tried not to think about John Wesley himself in a portrait on the wall behind me looking down with a bemused expression as I shared from the colonies…but the team were very gracious and welcoming. I’ll be interested both to unpack a little more of what I heard today, and to stay in touch with their story as it develops in the years ahead. In the UK church the word pioneer is everywhere. I think there’s barely been a conversation I’ve been in on this trip that hasn’t included it. And like many words in common use, it’s not always clear that all parts of the church use this particular word in the same way. For some, anybody doing something new (like planting a church, or starting a missional community) is a pioneer. For others, it’s a leader who is genuinely breaking new ground, helping the church find its way into contexts and situations that it has never been before. Every college, every training program, ever denomination I’ve encountered is thinking about pioneers. To some degree maybe it doesn’t matter much that the word is being used in a range of ways – as long as the sense that the church is moving in new directions, and releasing and supporting leaders to help make that happen is real. There’s just a slight anxiety for me that if everything is pioneering…then eventually nothing is, or at least the word (and the philosophy behind it) loses something. All that aside, today I visited Jonny Baker at the Church Missionary Society in Oxford. CMS is an order in the Church of England, and at Oxford (along with running a range of global initiatives) they’re embarked on training pioneers – both lay pioneers and ordained, and in both undergraduate and postgraduate streams. By my understanding they’re using the word pioneer to mean one who helps take the church into genuinely new, genuinely innovative places. Jonny is quite clear that what is now described as pioneer ministry actually emerged from a community of practice in youth ministry in the 80’s and 90’s. In other words, this is no new invention that has been dreamed up out of thin air, but an evolving practice that now has something like 40 years of contemporary practice and development. In that time-frame its emerging practice has unfolded alongside post-modernism and the post-christian environment. When the Mission Shaped Church report came along in 2004 (and with it the language of fresh expressions) this was tapping into a long emerging practice, but putting language and concepts around it that were accessible to the wider, institutional church. The kind of pioneer training that CMS are up to, particularly of the ordained leaders, seems to have evolved quickly in the time they’ve been at it. Early ordained pioneer ministers were trained alongside “normal” ministers and then given a little extra – I’ve heard it described (more than once) as “Priest +”. That seems now to have evolved into a quite specialist form of training. The philosophy of training pioneers at CMS seems to be around training them “in place”. All the coursework happens on a one-day-per-week basis, meaning the students can remain embedded in their local context (as opposed to a more traditional theological training where students are effectively set aside for the period of their training). In this regard at least, CMS’ approach mirrors that of St Mellitus that I visited yesterday. The challenge for graduates of the course might just be to find places to put their skills to use. Or perhaps that challenge is better put in another way – the challenge for the church is to be bold enough to deploy pioneers into new contexts – and to provide the permission, support and encouragement for them to do what they’re called, and trained, to do. My ears particularly pricked up when I heard Jonny talk about a “Mission Entrepreneurship” intensive that happens during the course (and that I think is open to others) in a partnership between CMS and Shannon Hopkins of Matryoshka Haus and Pickwell Manor. The intensive helps participants go from an ‘idea’ to a ‘plan’ in terms of a new missional idea. Ideas might be church related, or they might be about the common good (such as a new London based cleaning business called “Clean for Good” that evolved during one of the intensives a couple of years back and launched this week while I was in London. It caught my attention because Paul Wetzig (Queensland Churches of Christ) and I have been mulling over just such an idea for the Queensland context. I’m encouraged to revisit that conversation and see whether we might ourselves move from idea to plan. I’ve met Jonny a few times now, and the conversations are always rich and provocative. This one was no different. Delightfully today we were joined by Shannon from the FX USA team who I’d met at the ILC last week, and by the ever inspiring Michael Moynagh who just happened to be visiting CMS to be a guest lecturer for the day. Having completed the Fresh Expressions International Learning Community (which you can read about in my earlier postcards), I’ve moved to London for a few days meeting with interesting church leaders in a variety of settings. The emphasis has shifted a little away from FX to other areas of interest for the Synod of Queensland. I swung by St Mellitus College today, and joined the student body for their regular Monday morning worship before sitting down with Russell Winfield, the International Development Officer for the college. Now 10 years old, St Mellitus is a theological college launched from the well known Holy Trinity Brompton church. While it now operates largely independently of HTB now, it does still retain close links. 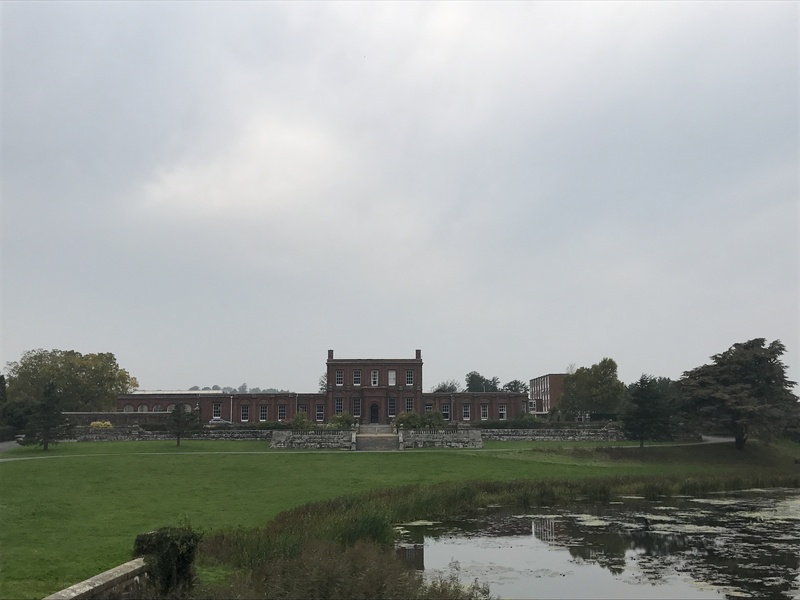 The story of St Mellitus has been one of rapid growth, from its initial year with just a handful of students, to now over 650 students spread across four campuses around England. I’m led to believe it’s comfortably the largest of the Church of England’s theological colleges, and draws students from 35 (of the 41) dioceses in the country. Those are the numbers. Beyond that, the range of courses offered (both post-grad and undergrad, along with non-accredited “lay” training) are typical, including a pioneering stream common to many UK colleges these days. The mood in the room, at least on the day I visited, was buzzing. Something like 2-300 students gathered (as they do each Monday) to start the college’s teaching day with worship (part of St Mellitus model is that all teaching happens on the same day – leaving students to do private study other days, and to be in field placements for 3 days per week). The worship is student led, so it various in style and format from week to week, and on the day of my visit it had a solidly contemporary/evangelical flavour. There was a buzz in the room, of anticipation, of chatting and catching up, of preparation for the day in what looked a relatively young student cohort. It was an altogether lovely and encouraging way to start the week. One story told during worship stuck with me. The leader was sharing an experience in which she with a group of friends had rented a house to live in an economically depressed area, with the intention of investing in the community there. They came to be known as “the church house”, with neighbours welcome anytime, the community supported, and people knowing it was a place they could always turn for help. Even “non-church” people in the community appreciated their presence and pitched in to help from time to time. It struck me that perhaps this is the core purpose of church, and that just about every neighbourhood could do with “a church house” like this one. No, it’s not rocket science, but I appreciated the reminder. St Mellitus College is located in an old cathedral style church called St Judes. The church building was turned over to the college in a pretty poor state, and with very little use from a pretty small congregation. The venue itself has been remarkably transformed – with the heritage of the building honoured (to my eyes at least), but an unapologetically contemporary flavour with smart, well planned additions to the building to enable it to serve both its original purpose, and its new place in the world. It strikes me that this is something of a metaphor for what St Mellitus are attempting to do – to honour their heritage while building a new church entirely. In a country expecting a huge number of clergy to retire in the next 10 years, and in which the church is in decline, St Mellitus is one way the church of England is addressing that challenge. The college’s philosophy includes study that is grounded in prayer and worship, and that is intricately entwined with the real world – where students are at the college building only one day a week (plus occasional residential intensives), but out in real-world field placements the rest of the time. Time will tell, of course, how successful St Mellitus will be. They seem to have their feet firmly grounded, and when I asked about evidence and outcomes, Russell was pretty clear that at only ten years of age, it’s hard to be sure. His view was that I should ask the question again in 40 years’ time to see if the initial growth, and early anecdotal evidence is supported by long term value for the church. I was glad to visit St Mellitus, and encouraged by what they’re up to. London Anglicans Planting 100 New Churches? After St Mellitus I headed over to visit the HQ of London Anglican Diocese church planting team. Formed as part of the Diocese’ vision for it’s future agreed to in 2013 (under the banner Capital Vision 2020), the team is at the centre of an intent to plant or significantly renew 100 churches within the diocese by 2020. Even in a Diocese the numeric size of London (500+ churches) this is a seriously ambitious goal, and a fair chunk of the time I had to visit was spent exploring how they’re going about the task. I would start by observing that they’re well organised, and they’re clear and unashamed about the target. There are a bunch of other elements to the Vision (to do with leadership development, faith sharing, doubling the number of young people engaged and so on) and all seem equally ambitious. Have a quick look here at the elements of their vision. Part of the strategy is to create and recognise what they describe as City Centre Resource Churches – the kind of larger churches that will be actively planting new churches (coincidentally a very similar description to one we’ve been starting to use in conversation at Queensland Synod this year). Other elements include fresh expressions (as an aside, this wasn’t the first or last time I heard fresh expressions talked of as part of a wider church planting strategy while I’ve been here…sometimes I think we separate the two…), training church planting teams, work on local government estates, revitalising struggling churches, partnering with area Bishops and one fascinating story about a purpose built boat that will be moored on the river adjacent to an urban renewal project that doesn’t have room for a church building, and from which the church will operate. 4 years into the project, and there have been just under 50 new or significantly revitalised churches launched. With 3 years to go, there is a sense of confidence that they’re on track. Interesting when the conversation turned to ‘failure’ rates, the statement came back that there had been a close to zero failure rates (I think it was actually zero, but my notes and memory have let me down on this…so I’ll say “close to zero” to be safe), and that this was a minor cause for concern…because it might mean that the church hasn’t taken enough risks. I found that a pretty refreshing attitude for an organisation as structured and generally careful as I assume the Church of England to be. Development for church planting teams included bespoke training, coaching, financial support (at one of three established ‘levels’) and assistance with matters such as strategy, financials, personal leadership, structures, buildings and so on. Additionally, the team have been operating what I heard described as a “Church Growth Learning Community” – a community of leaders from congregations who are committed to growing, and who meet together regularly over two years to explore strategies to do so. It’s not all sweetness and light of course, and when learning from an experience like this we have to take seriously the differences in both context (the UK is still quite different from Australia in terms of the place of the Church…particularly so for the Church of England…in broader society) and the capacity to deploy significant resources (people and otherwise) in support of agreed strategies. Still, I saw a church willing to set very clear goals, a church quite committed to learning again how to proclaim the gospel in a way suited to their context, and a church willing to make decisions and bring its people and resources to bear on the challenges of our day. I walked out with a little smile on my face, pleased for the Diocese of London that they’re on the path they’re on. One of the things I’ve heard said more than once when we’ve been encouraging people to try ‘fresh expressions of church’ (remember…a new kind of church designed for people who don’t ‘get’ church) is “I don’t know what to do”. In other words, “We’re ready to try something new, but don’t know where to start”. Around the world, there are a few simple models or approaches that are well understood, and well documented. Messy Church is one example, and there are at last count something over 200 examples of Messy Church (a kind of creative, hands-on, fun, messy approach to church designed for families with young kids) operating in Australia, and hundreds more in other countries around the world. Messy Church is a well understood approach, with great books, training and coaching available. It’s a relatively easy place to start. This week I heard some more about another well documented approach that is fast gaining traction in the US: Dinner Church. Now at one level gathering around a dinner table and engaging in practices of worship and disciple-building is nothing new (in fact arguably its where the Christian church started…so it’s a very ancient practice indeed) but the very fact of documenting an approach, and putting out lots of hints and tips not only helps people find a way to start, but in some way legitimises the approach. Dinner Churches (such as Be3 that I met this week, or St Lydias that seemed to start the pattern) are popping up everywhere, and understandably so. It’s a relatively simple approach to starting a fresh expressions, that’s relatively light on resource requirements. Tables, food, people, a commitment to gather are all that’s required. It all got me wondering what other relatively simple approaches to starting fresh expressions could be fairly simply documented – with the result being that a community who want to start could find something of a menu to choose from if their own ideas are slow in coming. Community gardens? Men’s Sheds? Café Church? Park Church? Pop-up Church? Now I have to say the obvious – one of the core philosophies being Fresh Expressions is that it’s effectively a contextual church planting movement – so the idea of putting up a menu of choices that would be parachuted in without paying attention to context seems to go against the grain. That’s a fair critique if all we do is put up three of four options and say “choose one and implement it”. If we offer three of four starting points, however, and encourage them to be shaped and moulded to fit the context, or used as imagination starters, that’s potentially a better way to go. For some people at least, my feeling is that a few well described options might just kick-start the imagination process that can sometimes take a little while to get going. The ILC, as I mentioned in the last postcard, featured teams from around the world and one of the ironies was that for the Australian team, we had to travel across the world to meet each other. Fresh Expressions in Australia (at least using that name), has an up-and-down kind of history that spans back around 10 years. A lot of energy was put into the movement from South Australia, and from NSW/ACT (from a number of denominations), and Mission Shaped Ministry courses consequently popped up in a number of states. It’s kind of bobbed along for the last few years with some real hot-spots (the Uniting Church Presbytery of Port Philip West in Victoria being an obvious one), but without a cohesive approach. This week we heard stories of well-structured national organisations in places like Southern Africa, Germany, Sweden and the USA. And we wondered…is that what we need to do in Australia? A central organisation, staff, structure, funding? It didn’t seem (to the Australian team present) to fit how things are ‘down under’. Instead we came away committed to animating a national network, and a national conversation – but leaving the specifics of action (such as coaching, training advocacy) to local (state-based teams). We came away committed to one another, to intentional communication and resource sharing (and with some concrete strategies to put in place for those things), but sure that (at last for now) a structured organisational approach isn’t the thing. We arrived as a group within which for each of us there were some friends, some acquaintances, some colleagues and some strangers, but left as the beginnings of a strong network, committed to one another, excited about the potential of an animated network, working (alongside others) to ignite in the church a call to be missional in nature, character and practice. It was a long way to go to meet the neighbours, but I’m every so glad that’s what happened. If you want to get in on the Australian conversation, hit this facebook group. The week also offered something of a reminder to me personally. Sheri and I have bounced around on the edges of the organised church for a long time now, involved in what we might have called “Fresh Expressions” (if we had had the language/label) from our young adult years right up until recent times. Early in this week’s gathering I felt like I was, once more, connecting with my tribe, with people who see the world in some of the same ways I do. I felt at home in the conversations, and found myself in the stories being shared. I came away convinced of two things. Firstly, that over the past year or two, I’ve stopped being a ‘practitioner’ myself, eased back from personally leading faith communities that are innovative in nature. I still contribute to my local church, for sure, but only within the patterns of regular church cycles and in regular worship gatherings. I realised that I’ve lost something of myself in this change in practice. I come home wanting to reconnect with the practitioner (or maybe even pioneer) in me. Secondly, that my involvement with the Queensland group wanting to encourage Fresh Expressions has moved in the wrong direction. In wanting to encourage Presbytery involvement, and in being a little cautious about the Synod being too deeply involved in things that aren’t its direct purview, I think maybe I’ve withdrawn too far. I think maybe I owe an apology to the team, and I might be asking them to let me back in (only if they’ll have me of course!). There’s a bunch of other stuff too, but for what was intended to be a short postcard, that’ll do for now. 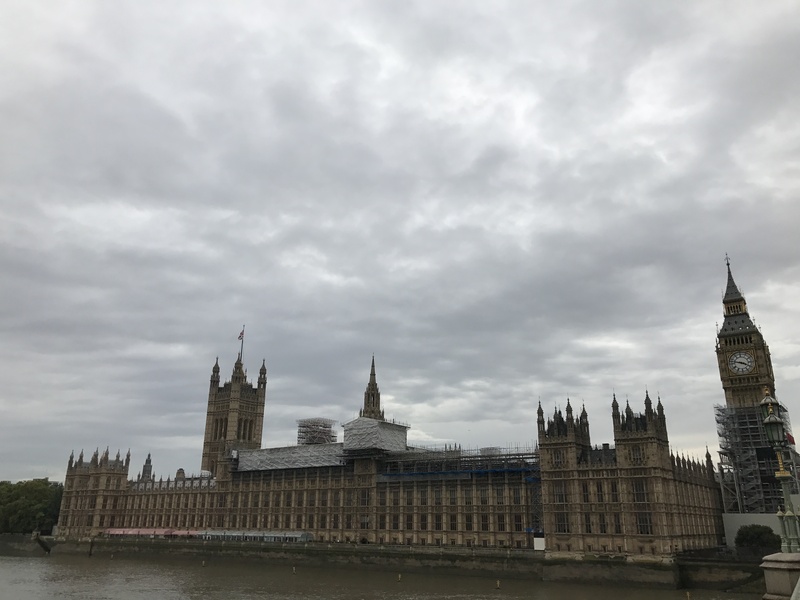 In the time since the ILC wrapped up last Friday, I’ve embarked on a series of meetings with interesting people in the UK leading activities such as church planting, pioneer minister training and more. The next series of postcards will reflect on those conversations.